The Imperial eagle is among the rarest birds in Bulgaria and worldwide. It had been among the most widespread raptors in Bulgaria but today its population numbers only 29 pairs. Most of these have remained in South-eastern Bulgaria and occur in highest numbers in Sakar. The Imperial eagle has for centuries been considered a sacred bird, because our ancestors had thought that it drives away storm clouds and saves the crops. 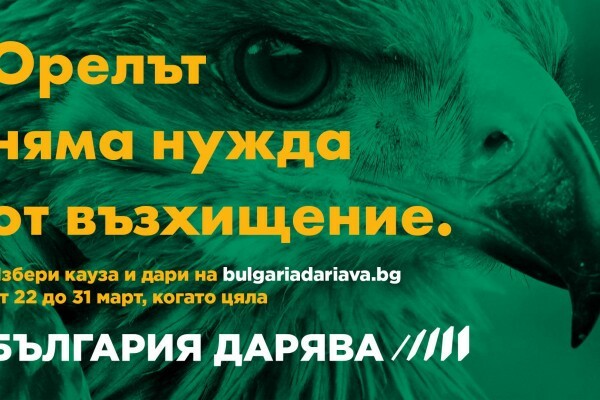 Even today it is believed in some parts of Bulgaria that killing or harming an Imperial eagle will bring serious disaster upon people. Its popular name is the 'cross eagle' because of the epaulet-like white spots on its wings which are visible in flight. There are many reasons for the drastic reduction of the species, but the mass-scale killing of raptors in the 50-70s period of the past century, habitat change and intensive agriculture are among the main causes leading to the reduction and disappearance of the wild animals upon which the Imperial eagle feeds. Improper use of pesticides in agriculture, illegal poison baiting and poaching still cause the death of many eagles. A new threat to the Imperial eagle has come about recently, a threat of which no evidence for it had been present. Satellite tracking of juvenile Imperial eagles within the LIFE project "Conservation of Imperial Eagle and Saker Falcon in key Natura 2000 sites in Bulgaria" or “Save the Raptors” (LIFE 07 NAT/BG/000068) allowed the BSPB to prove that a substantial number of the young birds die from electrocution, when attempting to perch on power grid poles without safeguards. 78% of the satellite tagged eagles whose destiny is known, have died of electrocution in Bulgaria and Turkey. The Imperial eagle (Aquila heliaca) is among Bulgaria's largest eagles, slightly smaller than the Golden eagle (Aquila chrysaetos). Its body size varies between 72 and 84 cm, and its wingspan is 180 to 215 cm. The adult birds are dark brown, almost black, with a very characteristic golden colour at the rear part of the head and neck. Usually, there are two white spots on the shoulders, of varying size, which may, in some individuals, be fully absent. The tail feathers are mainly yellowish-gray in colour. The juvenile birds have brown feathers, ochre in colour, which gives them their specific light brown appearance. The young birds' flight feathers are uniformly dark. Adult feather pattern is reached only after the 6th year. Concerning the intra-species systematic arrangement of the Imperial eagle (Aquila heliaca Savigny,1809), opinions vary. One opinion is that the species represents two sub-species - the Eastern Imperial eagle (Aquila heliaca heliaca Savigny, 1809) and the Western (Spanish or Pyrenean) Imperial eagle (Aquila heliaca adalberti Brehm, 1861). Other authors say that A. heliaca adalberti should be considered a separate species, Aquila adalberti. The Imperial eagle prefers rolling terrains and plains where forested areas or groups of trees alternate with open spaces such as pastures, agricultural lands and fallow lands. The Imperial eagle nests on single or in groups of tall trees growing alongside rivers, frequently in the immediate proximity to settlements, roads and arable lands. In the past, the species had nested in orchards as well. Its preferred altitude varies between 25 and 1,230 m.
The Imperial eagle is a monogamous species. 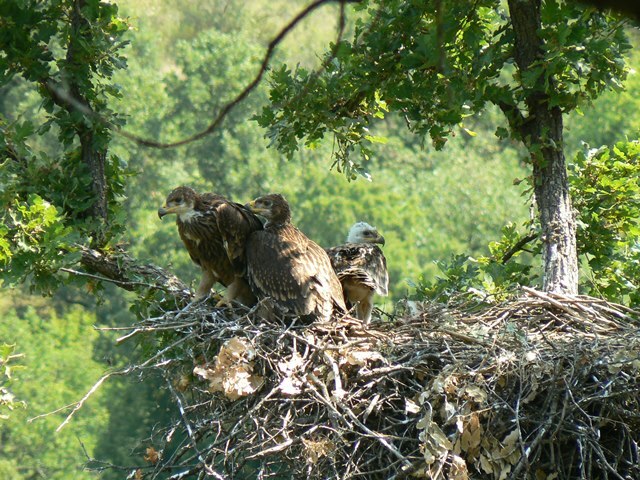 The pair is strongly attached to its nest and some nesting areas have been occupied by Imperial eagles for many years. The minimal distance (established using GPS) between the nests of various pairs is 4,700 m. The mating displays begin in February and are most intensive in March. They are very beautiful - the birds rise in the air and dive steeply with folded wings. The nest is 7 to 26 m above the ground. Both birds participate in its construction, using dry branches. The home of the eagle reaches 1.2 to 2.2 meters. It is 30 to 90 cm thick and can weigh as much as 200 kilos. Often, the pairs have more than one nest, using one and keeping the others as spare. The main trees used for nesting are hybrid poplars (Populus sp.) followed by various oak species (Quercus frainetto, Quercus pubescens, Quercus cerris, Quercus petraea). Less often, the nests are built on Scots pine (Pinus silvestris), European beech (Fagus sylvatica) and gumarabic acacia (Robinia pseudoacacia). Usually, the female lays 2 eggs, or, less often, 1 or 3 eggs, in the second half of March or in early April. Nests with 4 eggs have been known, although they are exceptional. Mainly the female sits on the eggs, replaced by the male to feed, or having food brought to the nest by the male. The incubation period is around 43 days long. The young are fed mainly by the female, while the male is responsible for delivering the food. The young leave the nest after the second half of July and early August. For some time they return to the nest to spend the night or stay near-by, still fed and trained to hunt by their parents. The birds remain in their nest region until the second half of September - the end of October. After that, the young birds migrate, usually reaching as far as Turkey, Israel, or Syria. One of the juvenile birds with a satellite transmitter was followed during the project as far as the Sudan. The adult birds stay and winter here permanently, because they are experienced hunters, unlike the juveniles, and are capable of feeding even during the cold months. The migration of the East European Imperial eagle was studied for the first time during the LIFE+ Project "Save the Raptors". Using satellite tracking of 22 juvenile Imperial eagles, we know now far more about the birds' wintering places, about their temporary quarters and about their lives. The Imperial eagle hunts in open areas such as pastures, meadows, and bare hills. Most often, the bird surveys, for hours in some cases, its hunting territory from a suitable observation point. It swoops on any prey flying precipitously low. 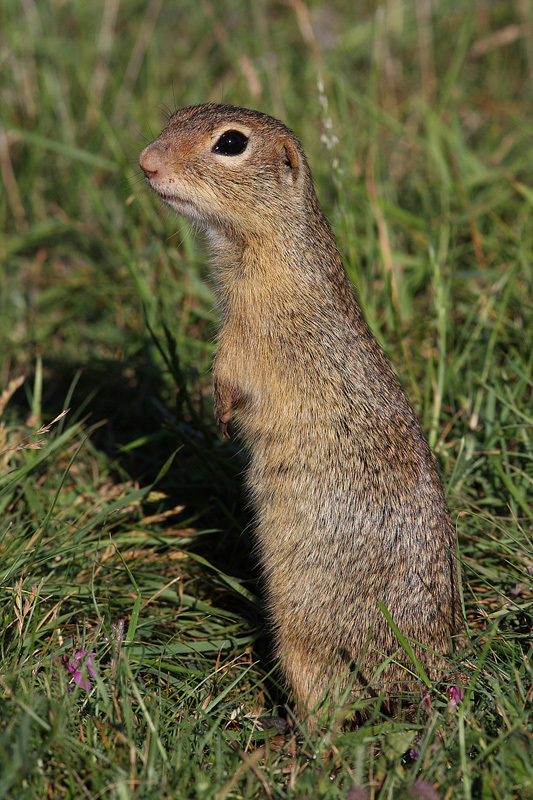 In areas with abundance of sousliks, the eagles fly low, several centimeters above the area most densely occupied by these rodents. In some cases the Imperial eagles may be observed perching next to the entrances toward the shelters of their prey. The main food of the Imperial eagle in Bulgaria is the hedgehog (Erinaceus roumanicus). It is followed by the souslik (Spermophilus citellus), the Hare (Lepus europaeus), the shrews (Microtus sp. ), the White stork (Ciconia ciconia) etc. Not being a specialized predator, this bird has a varied menu including more than 150 animal species. In the winter, the share of crows and carrion increases. Sometimes the Imperial eagle takes the prey of other raptors. Such behavior is particularly typical of the young Imperial eagles who are not sufficiently experienced as hunters. The Imperial eagle nests in Central and Eastern Europe and as far as Central Asia. The easternmost nesting point of the species was established in 1908 in the Daur steppe, at 115° eastern longitude. The current distribution of the species to the east reaches lake Baikal (110° eastern latitude), to the north, at 57° northern latitude in the Kugur forested steppe area, 35° northern latitude to the south, in the island of Cyprus, and in Austria to the west, 16° eastern longitude. A probable expansion of the nesting region to the north has been observed during the past decade, the species being seen nesting in the Kondo-Alim river area, at 59° northern latitude. One pair with a nest from which the juvenile had left, has been registered in 2008 to the north of 60° northern latitude. The species winters on the Balkan Peninsula, the Arabian Peninsula, in North-Eastern Africa, as far as Tanzania to the south, in South and East Asia, in India, as far as Korea to the east, Japan, Taiwan and, to the south-east, Singapore. The European population of the species has been estimated at 1,768 – 2,229 pairs (Demerdzhiev et al., 2011), and the global population is 5,200-16,800 pairs (BirdLife International, 2009). 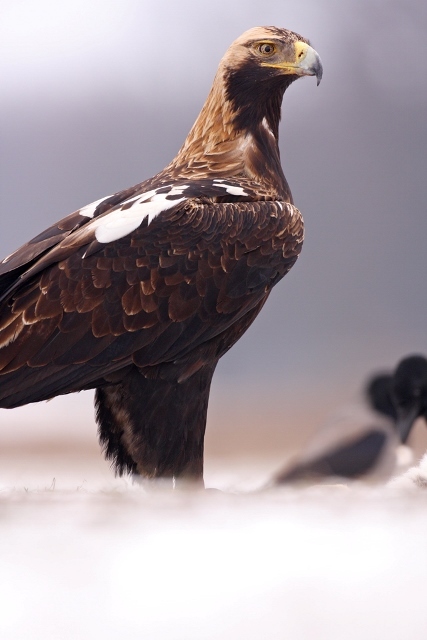 The Eastern Imperial eagle is classified as globally vulnerable (BirdLife International, 2012) and endangered at the European level (Tucker, Heath, 1994). It is included in Annex 1 of the Birds Directive, Annex 1 of CITES and Annex 2 of the Bonn and Bern Conventions. At the national level, the species is included in Annex II and Annex III of the Biodiversity Act, and, also, in Bulgaria's Red Data Book (Golemanski 2011). Deterioration of the feeding habitat (pastures and meadows) inside and outside of the Natura 2000 sites is a result of two inherently conflicting processes – the lack of management (grazing and mowing) resulting in pastures’ overgrowth with brush and conversion of grasslands into intensively managed arable fields, both of which hold little of the former diversity of eagle’s prey species, and notably the European souslik Spermophilus citellus – one of the eagle’s main food sources. The food availability (including density of prey populations) is the predominating successful breeding precondition – if that was not in place, the pairs will move away even if all other breeding conditions (existence of nesting trees, lack of disturbance, etc.) are in place. Hence, the best habitats are the extensively managed grassland with mosaic habitat structure and these are the type of grasslands that were significantly reduced since 2007 – data from two sample territories prove reduction of 40%. 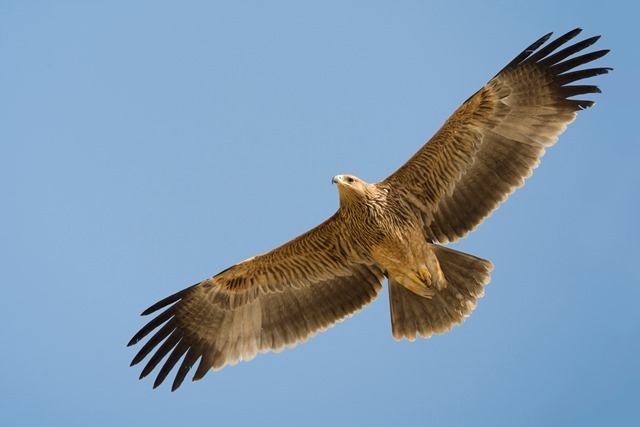 Satellite tracking of 22 juvenile Imperial eagles (within the LIFE project "Save the Raptors") has allowed us at long last to know with certainty that non-safeguarded power grid poles are the most frequent cause of death for the juvenile birds. These birds die most often due to electrocution by touching two conductors or a conductor and an earthed part of the facility. A large percentage of power lines in Bulgaria are a hazard for the large raptors and storks. Some of these lines are true death traps, killing scores of birds each year. The Imperial eagles like to perch on pylons. In some countries they even build their nests on long-distance line poles. Unfortunately, birds cannot differentiate between dangerous and safe pylons. 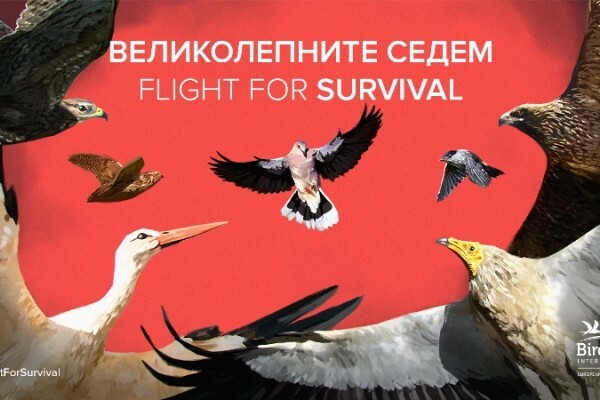 It is because of this particular reason that the BSPB has started working with all power distribution companies in Bulgaria in order to isolate the most dangerous poles near Imperial eagle nests. 390 dangerous pylons have been safeguarded during the LIFE project "Save the Raptors" and work in this direction is still under way. Widespread use of poisonous bait against predators during the 1950s is another reason for the disappearance of the Imperial eagles. Another serious threat to raptors are the pigeon breeders who also set poisoned bait in order to eliminate the Goshawk and the Peregrine falcon, which are the most frequent attackers of pigeons. However, all raptors fall prey, although all of them are protected by law. In June 2011, the juvenile Imperial eagle named Sofia and tracked by satellite transmitter by the BSPB during the LIFE+ project “Save the Raptors”, was found dead near the town of Perushtitsa. The poisonous bait which had caused the death of the bird was found near Sofia's carcass. The use of poison is strictly prohibited because it is a threat not only to domestic animals and wildlife, but also to humans. Unfortunately, poison baiting has not been discontinued. Disturbance by humans is a frequent cause of failure to hatch. Many trees with nests in Bulgaria are in open spaces near arable lands. The eagles are accustomed to traditional agricultural activities such as grazing, plugging or movement of carts or automobiles along dirt roads. In Sakar we can see a shepherd and his flock passing underneath the nest without any response on the part of the brooding eagle. However, the appearance of machines unknown to the birds or of differently behaving people causes the birds to leave the nest. Such cases are the appearance of a truck with workers, tourists, felling near the nest or shepherds shouting loudly. Leaving the nest causes death of the hatchlings due to cold or overheating. This is why the BSPB has organised permanent guarding of the most endangered nests during the mating period, increasing the nesting success by 30%. 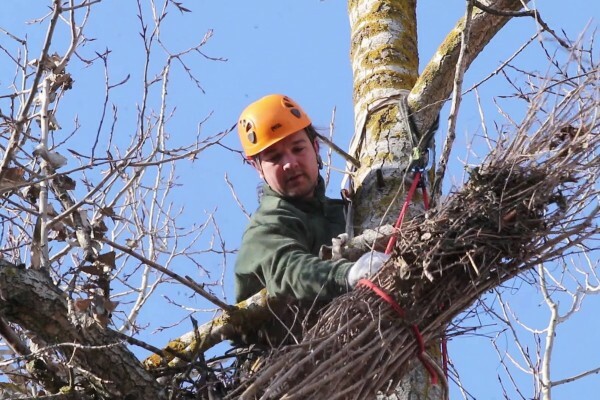 Often, the nest guards prevent human disturbance and, also, save the young if they happen to fall from the nest or if they are brought to the ground by storm, as has been the case during the recent years. The European souslik (Spermophilus citellus) is an important part of the food spectrum of the Imperial eagle in Central and Eastern Europe. Eagles prefer this rodent because it lives in colonies and, where available, provides ample food. Unfortunately, the souslik is also a globally endangered species and its numbers are dropping continuously. This is caused by the lack of suitable habitats – pastures maintained with low grass by traditional animal breeding. Several cases of Imperial-eagle nest robbing have been registered during the past two years, with the juvenile birds or the eggs being taken from the nest. The goals of the robbers remain unclear, but perhaps this reflects a misguided interest toward nature. The taken eagles usually die since keeping them at home is not an easy task. But even if they survive, they are doomed to a life in captivity and are lost to nature forever. However, if they are released, they quickly starve to death because of their inability to hunt or, because they do not fear from humans, are killed by poachers. Taking of wild animals from nature, and, especially, of a globally endangered species such as the Imperial eagle, is subject to extremely severe punishment by law. The Penal Code of the Republic of Bulgaria provides for imprisonment for up to 5 years and a fine of 1,000 to 5,000 for destruction, restraining or selling of wild animals endangered at the European or global level. Should you witness or doubt any such crime, please, contact us at (02) 979 95 00, 979 95 01. A large-scale campaign against raptors was started in the 1940s. These birds had been declared 'harmful' and exterminated on a mass scale. This elementary thinking had been the following: 'raptors eat hares and partridges and if we destroy them, there will be more for us.' Hunters had even been required to provide by the end of each year the legs of killed raptors to have their shooting license renewed. Of course, ecological science has subsequently shown that most raptors feed on rodents and are even 'useful' to us, humans. And those few who feed on game animals also occupy an extremely important place in nature. This was felt by hunters in Norway who had succeeded in exterminating raptors almost completely in the belief that this would increase the number of white partridges. The opposite happened – the numbers of partridges fell precipitously because of a contagious disease which had not been able to spread previously, as the sick birds had been eaten quickly by predators. Once the raptors had been killed, sick partridges managed to infect healthy partridges and the disease had become catastrophic. Today, all raptors are protected by law. However, it is too late for many of the species. Some, such as the Bearded vulture, have disappeared completely from Bulgaria's nature. Others, such as the Imperial eagle and the Saker falcon are at the brink of extinction. Traps placed near the carcass of a dead animal in order to catch wolves are a threat to eagles. The birds land near the carcass and may be killed or maimed by the traps. Several cases of Golden eagles suffering such fate have been registered in Bulgaria. Rural depopulation and the dropping numbers of sheep and other livestock have allowed pastures to become overgrown. Certain grass and brush species develop wildly, growing tall and suppressing the growth of the other plants. Such conditions become unsuitable for the souslik. Souslik requires diverse plant species for food, and low grass not preventing them from running and from seeing their enemies. They disappear in overgrown pastures. And they are the Imperial eagles' main food. Where sheep are present in sufficient numbers, they graze the grass uniformly and do not allow excessive overgrowing of the pastures. Intensive agriculture involving the use of many pesticides and introduction of monocrops has changed the hunting habitats of predatory birds and has reduced their key prey species. Furthermore, land aggregation required felling of many eagle-inhabited old trees between meadows. Felling of old growth forests, selective felling of old trees and afforestation of pastures has destroyed the Imperial eagles; breeding and trophic habitats. En-masse felling of poplars during the recent years is a serious threat. Imperial eagles in Bulgaria nets mainly on poplars - the only tall trees surviving in low-land areas in the country. Increased demand for poplar wood for export is the cause of large-scale legal and illegal felling. The lands of entire villages have remained without any poplars. Even two trees with Imperial eagles' nests have been felled while a third attempt was prevented at the last moment by nest guards. The absence of trees suitable for nesting is forcing the eagles to nest in areas where they are frequently disturbed and where the hatchlings often die. For this reason BSPB experts have built 35 artificial nests in carefully selected locations allowing for sufficient food sources, limited disturbance and no dangerous power lines. Fires can destroy inhabited nests directly. The number and size of fires in Bulgaria have increased drastically in the past decade. Some of the most devastating fires have occurred in regions of importance for the Imperial eagle. In 2000, a fire in Sredna gora was stopped within a few meters of the nest of an Imperial eagle. The use of pesticides in agriculture is causing the death of many birds. A campaign to decrease shrews in 1989 lead to the poisoning of thousands of predatory birds throughout Bulgaria. Many Imperial eagles died at that time as well. Strong winds and storms may cause nests to fall. In the 2000–2012 period, there have been fifteen registered cases of nests toppled over by strong winds in Bulgaria. Five chicks have died as a result, and one has received serious damages and could not be returned to nature. In 2012, a nest with two young in the Sakar mountain area fell victim to a predatory mammal, most likely a pine marten. Sometimes, when food is insufficient, the stronger and larger eaglet kills its weaker sibling. It is possible, also, that the weaker eaglet may die due to systematic malnutrition, since the pair of eagles usually feed the larger eaglet in the event of limited food resources. Approximately 35% of eaglet losses are caused by aggression in the nest or by starvation.